2.5 Lb. CAP 2" Rubber Grip Plate! 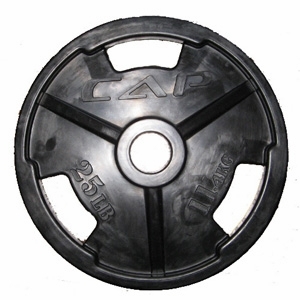 Olympic Rubber Grip Plates are designed for comfort and everlasting appearance. Each plate has specially designed cut outs to ensure a safe and strong grip when moving from one place to another. These plates are manufactured from high grade cast iron and coated 1/8" rubber for long lasting durability. With grip plates at these prices, you can't go wrong!Each Plate Is Sold Separate.